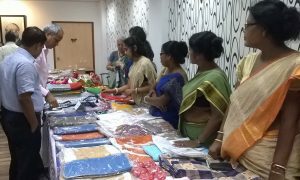 Larsen & Toubro, the company that supports women’s skill training as part of their Corporate Social Responsibility programme, conducted an annual audit in April, speaking with beneficiaries and examining their work. Revd. 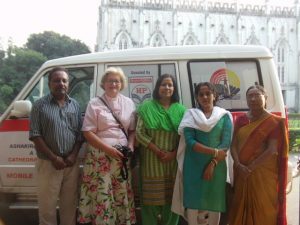 Loraine Mellor, who has been elected President of The Methodist Church in Britain for 2017-18, visited Kolkata to celebrate the 150th Anniversary of Kolkata’s historic Wesleyan Methodist Church (now under the jurisdiction of the united Protestant denomination, the Church of North India). On 14th October, Revd. 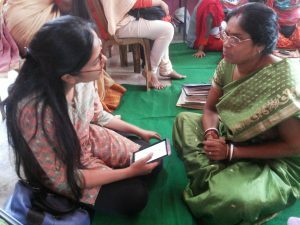 Mellor spent a day visiting CRS centres at Topsia, Bibibagan and Pally Mangal where she learned about the opportunities provided by CRS for children and women from slum communities. She also spent time at the new Nari Dana Production Centre in the grounds of St. Paul’s Cathedral. At the end of her visit she said, “I am inspired by the work CRS is doing especially the women’s empowerment programme”.